Many Biblical literalists and young-Earth creationists (YECs) maintain that there was no physical death before the first sin or "Fall" of mankind in Genesis 1. Among the Old Testament verses cited for this position are Genesis 2:16, which states that God told Adam not to eat of the tree of knowledge of good and evil, "for in the day that thou eatest thereof thou shalt surely die." A New Testament passage sometimes offerred as support for the position is Romans 5:12 which states, "Sin entered the world through one man, and death through sin." Some assert that these verses indicate that no humans, animals, or plants died before before the Fall, and that all were created to be physcially immortal. Others allow plant death, on the grounds that God gave plants as food to us and other creatures (Genesis 1:29-30), or because plants are not conscious or alive in the same way that animals are. Still others maintain that only humans were immortal before the Fall (Reem, 2005; Koukl, 2006). However, even if one interprets Genesis in a literal manner, when Biblical and scientific considerations are fully examined, the concept of "no physical death" is not well supported, and creates a host of theological, logical, and scientific problems. A more reasonable conclusion is that the verses in question refer to spiritual death, not physical death. 1. One major argument against the "no physical death before the fall" position is found in Genesis itself. God told Adam that he would die the day he ate the forbidden fruit; however, he did not physically die that very day. According to Genesis he lived many years afterward. So either the word "day" (Yom in Hebrew) did not mean a 24 hour day, and/or "death" did not mean physical death, at least not in the sense of "dropping dead". In any case, any potential discrepancies are resolved if one allows that Adam died spiritually that day. For those who wish to preserve literalism, note that the word "day" (Yom) can literally refer to an indefinite period of time, and that spiritual life and death are valid alternative (in a sense literal) meanings of those words. Spiritual death is also a key Christian tenet, just as is the concept of spiritual life and rebirth. Indeed, throughout the Bible the words "death" and "life" are often used in spiritual senses. This being the case, there is no need to complicate matters by insisting that "death" in Genesis 2 also refers to physical death, especially since doing so creates other theological problems, as well as massive scientific and practical ones, as discussed below. 2. Romans 5:12 is also clearly speaking of human sin, and by strong inference, the term "death" here likewise refers to human death. After all, no where does the Bible indicate that salvation is offered to any creatures except humans, or even that animals have souls or are capable of sin. Furthermore, the allusion to Adam's sin in this verse argues that it too discussing spiritual rather than physical death, for the same reason given in the previous point above: Adam did not physically die the day he ate the forbidden fruit. 3. Some creationists quote 1 Corinthians 15:21-22: "For since by a man came death, by a man also came the resurrection of the dead. For as in Adam all die, so also in Christ all will be made alive. (1 Corinthians 15:21-22) as evidence that there was no physical death before the Fall. However, there are several reasons to reject this interpretation. First, the verse is just as meaningful if not more so, if spiritual death is meant rather than physical death. Second, as in Romans 5, the term death here refers to human death rather than animal death, as there is no indication that animals are resurrected; in fact there are verses indicating the opposite. Third, the allusion to Adam's death at the Fall, which did not entail physical death (at least not immediately), argues that the "death" in all of these verses is meant in a spiritual sense. Otherwise, the parallel is lost. 4. In drawing the parallel to Jesus as the second Adam in the New Testament, many strict creationists inadvertently help reinforce the above points. Jesus said, "..whoever lives and believes in Me shall never die..." (John 11:25-26). But in this case as in others, He must have been referring to spiritual rather than physical death, since we all still physically die. 5. In many other Bible passages, the word "death" is used in a spiritual sense rather than a physical sense. Although it is also possible for the word to be used at times in a dual sense, virtually all theologians agree the "death" in Genesis 2:16 includes at least spiritual death. In view of this, we would need a compelling reason to extend the meaning to include physical death (for either animals or humans). The Biblical considerations fail to provide these reasons, and along with compelling scientific and pragmatic considerations discussed below, actually point to a contrary conclusion. 6. Some authors point to verses regarding the appearance of thorns and woman's pain in childbirth (Genesis 3:16) as evidence that the creation began to "die." Whatever the meaning of these verses, they do not demonstrate that no creatures died before the fall, or that there was no pain before the fall. If anything, the opposite is demonstrated. Genesis states that woman's pain in childbirth would be increased. One cannot increase something that does not already exist. 7. Some authors argue that since the original Creation was declared "good," and since death is inherently bad or evil, there was no physical death before the Fall. However, this is largely an emotional appeal. There is no compelling theological argument that physical death is inherently evil. Indeed, a number of Biblical verses suggest the opposite, as 1 Corinthians 15: 36. Rodney Whitefield (2007) demonstrates that the Hebrew language of the relevant verses does not preclude animal death. Moreover, the Bible indicates that God himself often caused or allowed the death of humans and animals for various purposes, including animal sacrifice, the clothing of Adam and Eve with animal skins, the great loss of life in the Genesis Flood, etc. The Bible also indicates that God provided carnivores with other animals as food. So unless one wants to ascribe evil activity to God, physical death cannot be inherently evil. For further Biblical support that physical death is not inherently evil or bad, see http://www.godandscience.org/youngearth/death.html. Moreover, biologically, death is an important part of all ecosystems, and without it, life itself could not exist in a "good" state very long, as discussed further below. 8. That God told Adam (in Genesis 2:16) that he would die the day he ate of the forbidden fruit is often cited as evidence that humans were created to be immortal. However, the verse does not say that, nor is it even logically implied, even if the "death" in this context meant physical death. After all, if someone told you the day you drank a bottle of poison, you would die, would that mean that if you didn't drink it, you would be immortal? 9. Genesis 1:29-31 states that God created plants and gave them to animals as food. Some claim this implies strict vegetarianism by all creatures before the Fall. However, it does not say that all animals ate only plants. Furthermore, all animals do use plants as food in some fashion, either by eating plants themselves, or by eating animals that eat plants. Moreover, there is no Biblical indication that any plant eaters became carnivores only after the Fall. Genesis indicates that after the Fall God gave humans permission to eat meat, but there is no indication of a change in diet for other creatures. Moreover, numerous creatures appear to be strict carnivores, with countless adaptations for capturing, killing, and digesting other creatures. They would have to be re-created in a quite different form if they were not originally so (in contradiction to creationists own insistence that Creation stopped on day 6). The issue of carnivorous animals will be dealt with in more detail below. 10. Providing food implies the potential for starvation. One may reasonably ask, if humans (or humans and animals) were immortal before the Fall, and could not starve, why did they need food? Other Biblical verses also indicate that predation and animal deaths are part of God's "good" creation. For example, Psalm 104 (20-28) states, 20 You appoint darkness and it becomes night, in which all the beasts of the forest prowl about. 21 The young lions roar after their prey and seek their food from God. 27 They all wait for You to give them their food in due season. 28 You give to them, they gather it up; You open Your hand, they are satisfied with good. 12. Apparently Adam was familiar with carnivores before the Fall. Genesis states that Adam named all the animals, and that this happened before the Fall. Assuming one accepts this portion of Genesis literally, as most strict creationists do, it would seem to argue for pre-Fall carnivores, since many of the Hebrew animal names appear to indicate a predatory lifestyle. For example, the Hebrew root in the name for lion means "in the sense of violence." Since Adam named the animals before the Fall. Likewise, Adam named some birds using a Hebrew word meaning "bird of prey." For the eagle, Adam used a Hebrew word whose root means "to lacerate," and the Hebrew root for "owl" means to "do violence to" or "treat violently." It does not seem logical that such terms would be used for plant eaters. These terms seem much more compatible with carnivorous activity than plant eating. 13. Genesis 3:22 reads, "And the LORD God said, Behold, the man is become as one of us, to know good and evil: and now, lest he put forth his hand, and take also of the tree of life, and eat, and live for ever..." Logically, immortality could not have been part of the original creation, if eating from the tree of life provided immortality. 1. Unchecked reproduction would lead to nightmarish levels of overcrowding in a matter of weeks or less. 2. Many organisms are obligatory predators. 3. 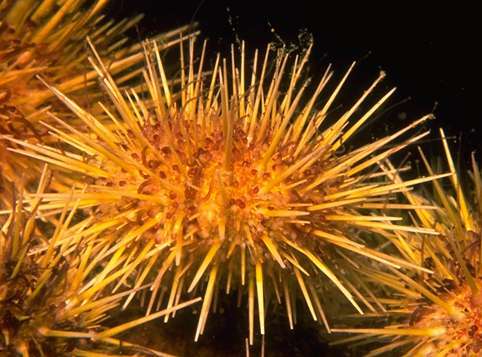 Many animals have elaborate defense mechanisms against predators. 4. Countless small organisms are routinely killed as larger organisms eat and walk. 5. Many organisms die of accidental deaths. 6. For physical immortality, absolutely all aging would need to cease. 7. Physical immortality removes the need for reproduction. 8. Vital ecological cycles cannot work if organisms do not die. Each of these merits further discussion. 1. God commanded the creatures to be "Fruitful and Multiply." 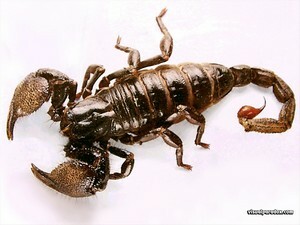 However, as thousands of species, including countless microbes, insects, worms, rodents, etc. obeyed this command and reproduced unchecked (without physical death), the entire Earth would soon be awash in a horrific mass of exponentially exploding populations. Indeed, considering the reproduction rates of many invertebrates alone (some producing thousands of offspring in a single generation), within days to weeks at most the Garden of Eden would become a veritable hell on Earth. Peace and tranquillity would quickly be replaced with unimaginable overcrowding, pestilence and starvation. A bizarre paradox would also ensue. Soon animals would have no food to eat, nor space in which to live, and yet no ability to die. This is not only an absurdity and logical paradox, it is at direct odds with God's stated plan for a "good" creation. 2. Obligatory carnivores, such as those shown in Fig. 1 and many others, present a serious problem for the "no physical death" positon. Many animals have extensive anatomic features that have little if any use except for capturing, killing, and eating other animals. 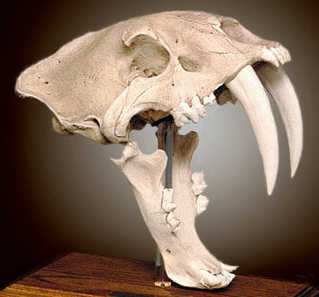 Whereas some strict creationists assert that some apparent carnivores might have used their sharp claws and dagger-like teeth for grasping or shredding plants, in many cases the features in question seem far better suited, or only suited, for predation. 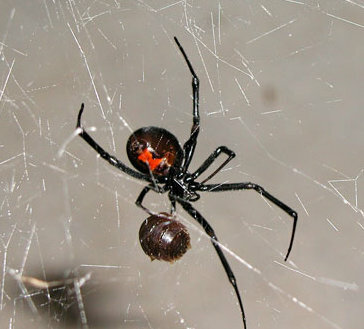 For example, almost all spiders spin webs to capture prey and bear sharp fangs with poison glands to paralyze or kill their victims before devouring them. 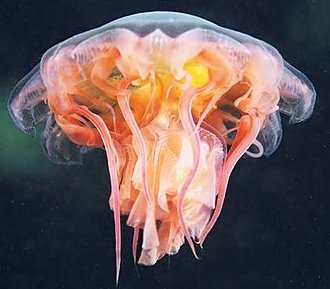 Likewise, jellyfish, sea anemones, and other Cnidarians have stinging tentacles and stinging cells. Such features are hardly needed for subduing plants. Many other animals have fangs, poison glands, stingers, or other specializations for stunning, capturing and/or eating prey. Numerous bat species have echo-location systems specifically tuned for small insect prey. Owls not only have talons, sharp beaks, and binocular vision well suited for predation, but also special feathers that allow for silent flight while hunting at night. Would they have originally launched stealth attacks on melons and apricots? 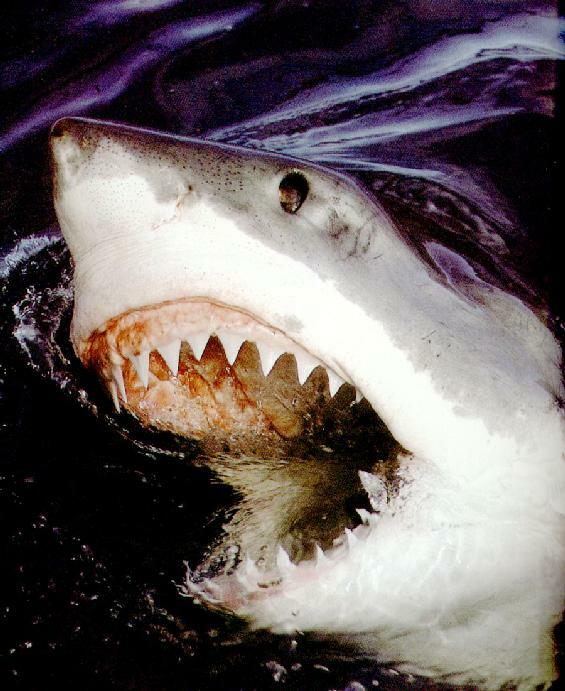 Among aquatic animals, obligatory predators include sharks, killer whales, barracudas, and piranhas, just to name a few. 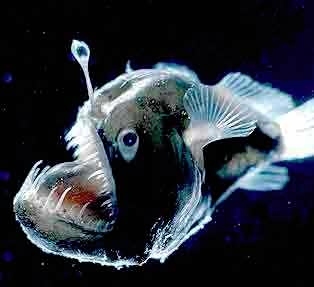 The deep-sea angler fish, with long needle-like teeth and head-lure used to attrack prey, is especially hard to imagine as a herbivore. 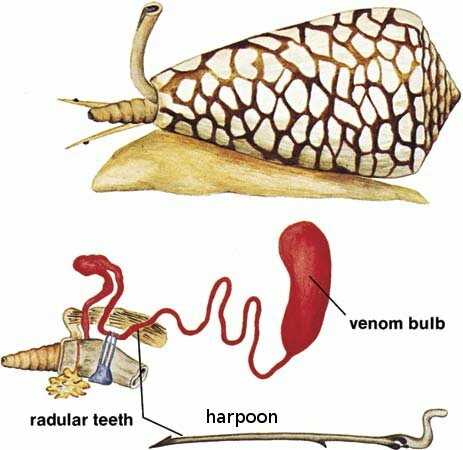 Even toothless whales have baleen structures for straining out millions of krill (mostly tiny crustaceans) with every mouthful of water. Even if one imagined these whales originally fed on some kind of plants, countless small sea animals would be inevitably swallowed with the plants. Even in the plant kingdom, some species such as sundews and Venus Fly Traps obtain much of their nutrition by trapping and digesting insects and other small animals. Besides countless modern predators that cannot be reasonably viewed as one-time herbivores, many more extinct animals were likewise clearly bligatory predators. 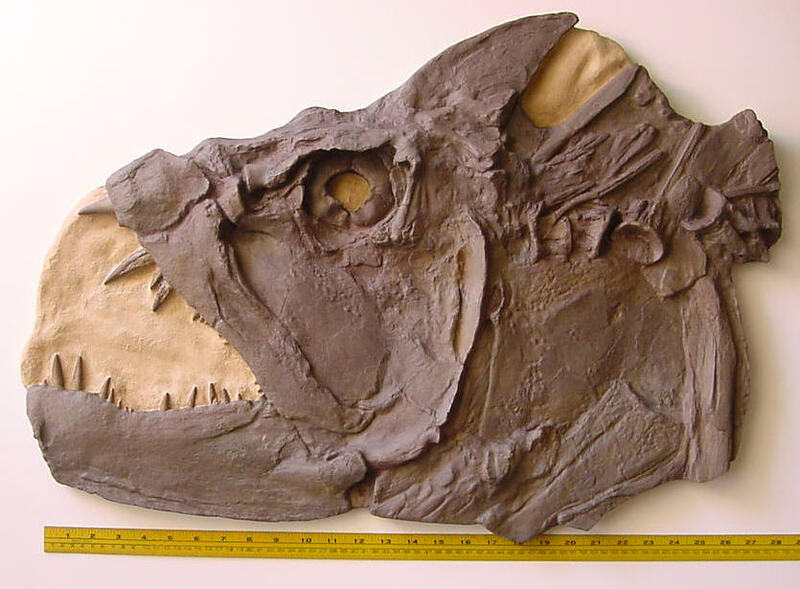 One example is the fierce-looking Cretaceous fish named Xiphactinus (Fig. 1b), whose fossils sometimes include skeletons of fish inside it's belly. Some creationists have countered that perhaps many organisms were changed after the Fall--citing God's curse on the snake to thereafter crawl on its belly. But in many cases the creatures in question would have to be redesigned in such major ways (including the creation of new structures, not just reduction or elimination of old ones) that it would contradict another basic tenet of strict creationism: that God did all his creative work on the first six days, and thereafter rested. Jonathan Sarfati suggests that "since God foreknew the Fall, He programmed latent genetic information that would be switched on at the Fall." However, this raises some sticky theological arguments, and ignores the evidence discussed above that the Bible itself acknowledges the existence of carnivores before the Fall. Also, other problems arise: for example, without physical death the Fall would have been required the Fall to avert a catastrophic population explosion, meaning that humans would loose either way --a concept I doubt most thelogians would endorse. As an aside, it is obvious that death for plants was part of the creation plan, since Genesis indicates that God gave creatures plant as food (but does not say only plants). While some animals only eat parts of some plants, in many other cases entire plants are routinely uprooted and eaten by a variety of animals. Clearly then, many plants died before the Fall. Some creationists assert that plants are not fully "alive" in the same sense that animals are alive, and therefore cannot "die." However, even if we disregard plants altogether, severe problems remain in a world without physcial death. 3. Many animals have defense mechanisms or structures to fend off predators, as shown in Figure 2. 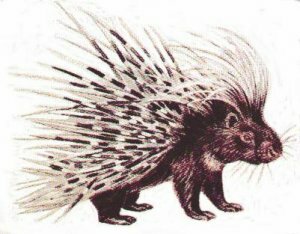 These include everything from sharp spikes and spines (as on porcupines and puffer fish) to highly offensive odors (skunks), to poisonous glands in their skin (various amphibians) to corrosive or toxic sprays (skunks, cobras, etc.) to protective armor (turtles, armadillos, etc). Some creatures employ more than one defense mechanism. 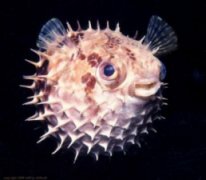 For example, puffer fish not only have sharp spines, but can inflate their bodies to extend the spines when threatened or attacked. Figure 3. 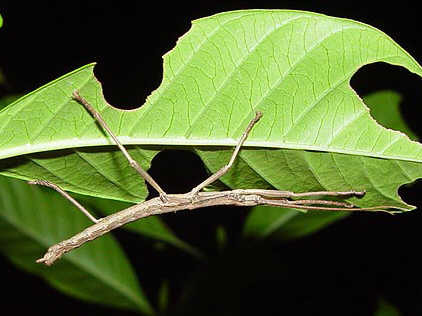 Leaf insect and "walking stick"
Other defense mechanisms include camouflage and mimicry, where creatures like cicadas and "walking sticks" often closely resemble parts of plants or other animals, in order to conceal themselves or repel predators (Figure 3). 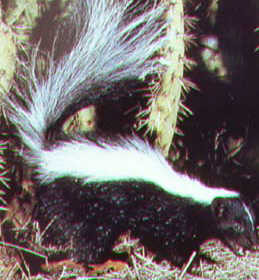 Poisonous animals are often brightly colored, as well, which evidently serves as a warning to predators. What would be the need for any of these defense systems if all creatures were herbivores? Ironically, strict creationists often cite the Bombardier beetle, which shoots a noxious chemical mixture at predators, as an example of a wonderfully designed creature. But again, what would be the purpose of such a defense system if there were no predators? 4. Animals routinely squash and inadvertently injest other organisms as they walk, eat, and carry out their daily activities. With every meal, even obligatory herbivores typically swallow a multitude of tiny animals such as aphids, mites, insect larva, etc, besides millions of microbes. Are we to assume that not a single elephant, cow, or rhino (let alone dinosaur) would ever accidentally ingest or step on a single ant, spider, or worm, or that God was continually rescuing millions of tiny animals from such fates? On a smaller scale, billions of bacteria and other microbes are continually reproducing and dying as part of the normal microecology of larger animals, within their digestive and disease fighting systems. Why would disease fighting systems even exist if no creatures could ever die? 5. Many animals (and humans) die every day from a variety of accidents (falling, choking, suffocating, etc). For this to never occur, we would have to assume that none of the originally created creatures were capable of errors in judgment, balance, movement, etc., or that God continually saved them from any accidental deaths. But there is no Biblical or scientific justification for these secondary assumptions. Indeed, Genesis says that the original Creation was "good," not perfect. Only the latter would prevent accidental deaths. 6. Physical immortality would require a total cessation of all aging processes. The problem is, as long as their were sunlight, background radiation, bacteria, etc. in the original creation, its hard to imagine how absolutely zero aging would occur, unless there was a continuous and perfect rejuvenation process. But again, God did not say the original creation was perfect, just good. Moreover, as already discussed without aging and death, the original creation could not stay "good" for very long, and would soon become unimaginably hellish with exponentially exploding population growth. 7. As noted by Glenn Morton, if creatures were meant to be immortal, there would be no need for reproduction. God could simply have created the optimal number of creatures of each kind, and they would have lived forever. Reproduction is thus tied to the cycle of life and death. Reproduction is needed to replace dying individuals. Death is also needed to avoid unchecked reproduction and its devastating results, as already discussed, and is ecologically important (point 8 below). 8. Death is ecologically important. It allows for the dissipation and recycling of nutrients in the environment. For example, when plants and animals die, their bodies are decomposed by other organisms (mostly microbes and fungi) which return nutrients to the Earth, allowing plants to grow. Stop all death, and such cycles eventually stop, preventing plants from growing. Without plants, many animals which eat only plants cannot live. And yet if there is no death, then they cannot die, and we are left with another absurdity and paradox. Some commentators have suggested that these problems are largely resolved if the lack of physical death before the Fall applied only to humans. However, as discussed earlier, the Biblical considerations indicate that the "death" referred to in both Genesis 2:16 and Romans 5:12 was spiritual, not physical. Furthermore, even when limited to humans, most of the above problems remain, especially the critical problem of unchecked population growth. Even assuming very low reproduction rates of 2 children per couple per generation, without physical death the human population would explode to over a trillion individuals within just 50 generations, and keep expanding exponentially, with all the accompanying horrors and absurdities discussed earlier. Certainly this could not have been part of the Creation plan. One could propose that God would stop human reproduction before this point occurred. However, not only is there no need for such secondary proposals, or any indication of the idea in Genesis. Furthermore, stopping reproduction soon after humans were created would entail new theological issues, such as preventing any new people from ever existing. The concept of "no physical death" before the Fall is Biblically and biologically unsound, not only for plants and animals, but humans as well. Those who advocate the position have neglected serious Biblical and scientific difficulties (including the ramifications of unchecked reproduction). However, the problems are resolved, and parallels with New Testament verses better maintained, if one allows that the term "death" in Genesis 2 (and elsewhere in scripture) refers to spiritual rather than physical death. "No Death Before the Fall - A Young Earth Problem," by Rich Deem. Many of course allow that all or part of Genesis may be largely allegorical or metaphorical rather than literal. Indeed, the poetic constructs, elements such as a talking snake, God anthropormorphically strolling in the Garden, and indications of symbolism in several places (the Tree of Knowledge, for example), compels even many evangelical believers to accept that at least parts of Genesis are non-literal, especially in view of considerable scientific evidence that humans developed (physically) from hominid beings. 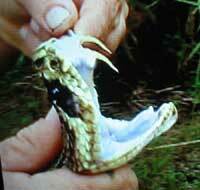 Also, although the snake in Genesis is often interpreted as Satan, this itself requires a non-literal reading. Otherwise, one would maintain the "most cunning creature" was an actual snake (or snakes in general). Likewise, the "curse" would read as if it were given to actual snakes after the Fall (explaining why they move on their bellies). This makes little sense if Satan rather than an actual snake was responsible for the Fall. In any case, this essay shows that even when read literally, the Bible does not support the concept of "No physical death before the Fall." Another demonstration of the point that the Creation was not perfect is the existence of a tempting and "cunning" serpent (usually interpreted as Satan) in the Garden of Eden even before the Fall. A counter argument offered by some is that the great ages to which the early Biblical patriarchs lived (hundreds of years) indicates that they were originally immortal and only at the Fall began to degenerate and age. However, there is no indication that these were typical ages rather than select exceptions of chosen or special persons. Furthermore, to propose immortality would seem to require the total elimination of all aging and cellular degeneration--in short, perfect biological beings. But as noted before, Genesis does not state that the Creation was originally perfect, just "good." One might as easily propose that early patriarchs lived longer because of the idea environmental conditions at the beginning, and/or lack of genetic errors, etc. These do not require the presumption of immortality before the Fall. Without physical death, one could suppose that human reproductive years would be greatly increased, and that many couples might have large numbers of children over many years. However, let us be conservative and assume that each couple would have an average of only 2 children, with each generation being 20 years. Without death, the population would then double every 20 years. In just 50 generations (1000 years) there would be over 1,125 trillion people on Earth. To grasp the enormity and absurdity of this figure, realize that the entire Earth's surface has only about 510 trillion square meters (about 600 square yards)--including the oceans. In a few more generations, there would be more people than the number of square feet on Earth, and a few more generations, more people than square inches on earth, which obviously is impossible. One could propose even lower reproduction rates, but that would not solve the problem, only prolong it. One could propose that at some point God would rescind his command to be fruitful and multiply, and stop human before serious overpopulation problems occurred. But that would mean that no new individuals could ever exist thereafter, and create new theological theological problems. For example, the Bible says that God knew each one of us from the foundation of the world. How could that be if reproduction were stopped early on, and future people like us had no chance of existing? Also, how would even the resulting static population of humans ever get to heaven-- assuming that God intended them to get there? One could offer even more fantastic proposals to address the overpopulation problem, such as God miraculously making the size of the Earth continually expand, or periodically and directly removing batches of people from the earth (to heaven or some other place?). However, there is no Biblical or scientific support for such extreme notions. Last, one could say that all of this is moot, since God knew that Adam would sin soon after he was created. But that suggests not only pre-knowledge of the Fall, but virtually an inevitability to it--which again, brings a new set of theological problems. It would also imply that if humans sinned, they'd be cursed with physical and spiritual death, but if they did not sin, they would soon suffer the horrors of uncontrolled overpopulation. Does anyone want to suggest a Creation plan with such a "no win" scenario? Allowing physical death as part of the original Creation solves these dilemmas, while preserving the important spiritual meaning of the Fall.